Eastside Corridor Constructors, consisting of: Granite Construction Co., PCL Construction Services, Inc. In order to increase safety and travel reliability on the busy regional corridor of SR 520, the three-year Eastside Transit and HOV Project was initiated. Specific improvements include widening SR 520 to a six-lane highway with wider, safer shoulders, adding a bicycle/pedestrian path, rebuilding interchanges and installing fish-passable culverts. In order to revitalize a stream for fish passage purposes, two undersized culverts needed to be replaced. Because Washington State Department of Transportation (WSDOT) would only allow the busy SR 520 corridor to be closed on the weekends, a product that would provide for a fast installation was imperative. 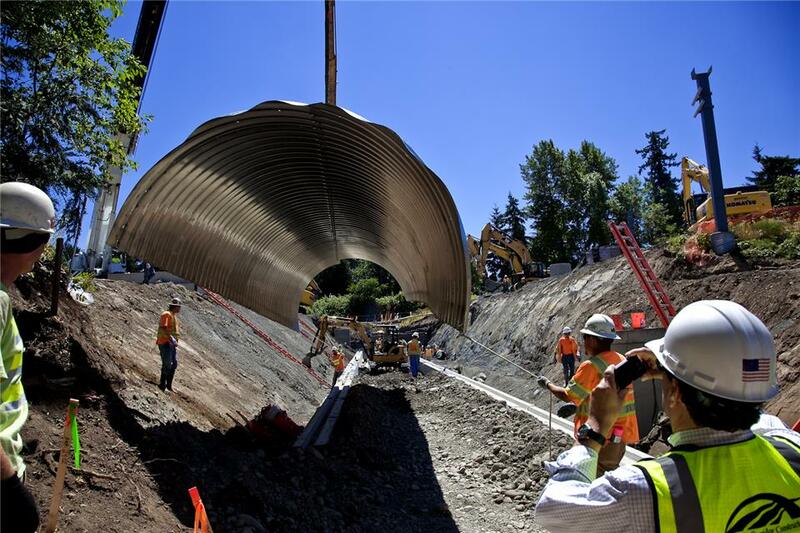 Contech provided two Aluminum Structural Plate structures to replace the undersized culverts. The new structures were 12-ft. x 6-ft.-3-ft. x 251-ft. and 11-ft. x 5-ft.-8-in. x 215-ft. in size. The original strategy for replacement called for a multi-stage, deep shoring approach which would have involved closing single lanes for several days at a time and would have taken more than one month to complete. By utilizing the quick assembly and ease of placement inherent in Contech’s Aluminum Structural Plate structures, WSDOT was able to greatly reduce the length of installation. In fact, Eastside Corridor Constructors, the engineer and contractor on the project, was able to install the aluminum arches in a single weekend without disrupting rush hour traffic on Friday evening or Monday morning. Aluminum Structural Plate weighs 1/50 as much as a reinforced concrete pipe, reducing assembly and equipment costs and allowing for easy handling of long, preassembled structures. Prior to installation, this structure was pre-assembled in the field, contributing to the quick installation.